Saint Louis Armstrong Beach is not a place, he's a person. 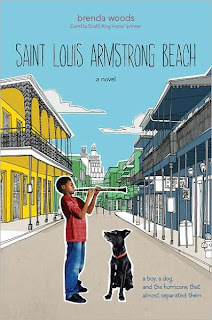 Twelve year old Saint is learning to cope with the pains of first love, a stray dog, his family, and his love of music - all within the time period of Hurricane Katrina. Author Brenda Woods takes us right into the heart of New Orleans, and it's people. You can feel the music, food, and soul of the people of the city reading this book. You will be cheering Saint on as he tries to rescue his dog, and his neighbor when the hurricane finally hits. 4 stars!